The 1965-Watts Revolt grew out of a crowd who witnessed the perpetual dynamics between law enforcement and a black family in South Los Angeles. On August 11, 1965, Marquette Frye was driving with his brother, Ronald, who had just gotten home from the military. Marquette was pulled over for drunk driving at the intersection of Avalon and 116th Street. A crowd, who witnessed the stop, gathered and continued to witness how the incident escalated. Many media outlets and books offer summaries and portrayals of this incident and are easily accessible. We encourage you to learn more about the incident, Marquette and his family’s life after the six days of revolt. Think about how this impacted the family. History took place on these very streets. The curfew zone set in place included a 45 square mile radius, but the days that followed highlight the Charcoal Alley in Watts, a 2.5 square mile neighborhood. Why was the focus on Watts? What was going on at the time that led a community to engage in revolt? The answer can be found in the endless obstacles that stood in the way of a high quality of life for residents of Watts. At that period of time, many Watts community members lacked the basic means for human dignity and were left with under-performing schools, lack of access to quality health care, substandard housing, high unemployment rates, and constant violent encounters with law enforcement. The revolt intensified on Friday, August 13, 1965 (exactly 50 years ago today) and about 2,300 National Guardsmen joined the local police; the number increased by August 14. The incident with Marquette could be perceived in many ways, but at the time many used it to perpetuate an interpretation of Watts as a violent community. Of course the unjust living conditions of its residents was left out of this narrative. As we continue to remember 1965 Watts, please take the time to reflect and learn more about U.S race relations, community development and advocacy, and policing over the last 50 years. Think about what we can learn from 1965 Watts and how we can move forward as a people advocating for basic human dignity and quality of life. Are we repeating history or have we progressed? We also invite you to join the many events over the next half of the year and the rest of this week. Come to Watts and witness, first hand, our resilient life, culture, and identity! 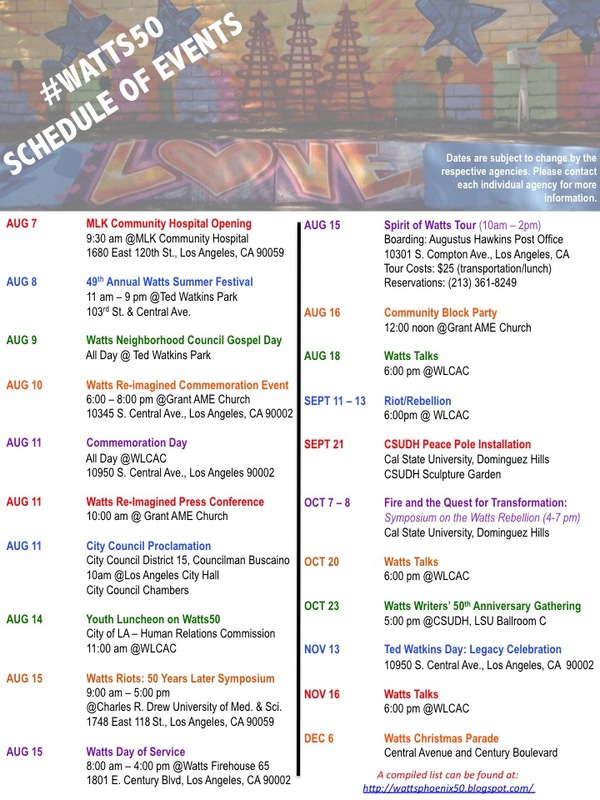 Check the dates and times for special events in Watts this August. 2014 was a great year for Watts! The Watts Community Studio has spent its time identifying new and innovative ways to continue its commitment to residents of our neighborhoods which remain impacted by poverty and a limited access to resources that respond to the findings of the 2013 report. At this juncture, WCS will partner with agencies for one annual project as it develops into a formal organization. Future posts will include our vision, mission, and directions. For now, here is a brief overview of some 2014 local events (since there are too many) that attest to Watts’ vibrancy, resiliency, and diversity, addressing the 2013 report findings’ neighborhood priorities. In the 2014 Rose Parade, the Watts Towers shared a float with many treasures of Los Angeles (e.g. Hollywood Sign, Olvera Street, Endeavor’s voyage). This moment solidified the importance of Watts for the City of Los Angeles. Weeks later, Mayor Eric Garcetti attended mass at Saint Lawrence of Brindisi Catholic Church with Councilman Joe Buscaino. The presence of the two elected officials impacted many residents who were excited to witness their commitment to Watts. 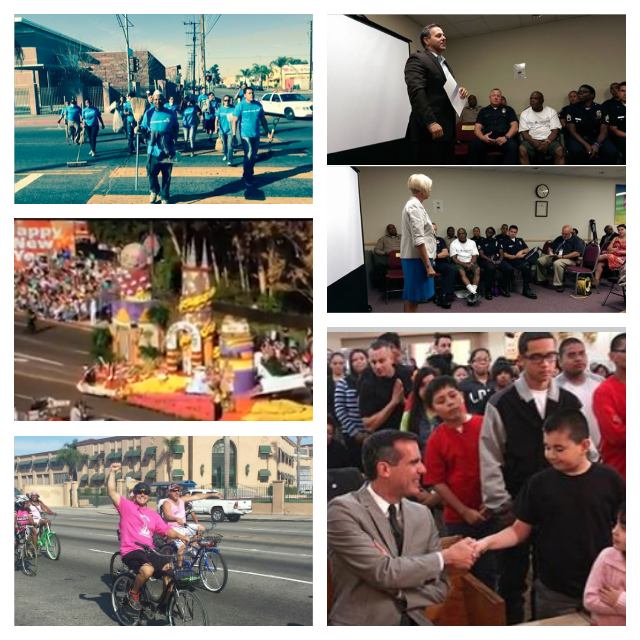 These moments actualized the value of Watts, as a neighborhood of resiliency and diversity, truly stands. Neighborhood Priority #1: Employment – If not the toughest, employment is one of the top most difficult community priorities to address. The 2013 report found that Watts has a 13% unemployment rate, not considering those groups out of the workforce that represent a large population of Watts residents like the long-term unemployed and previously incarcerated. Participating in the workforce and opportunities to work are instrumental to community development. Important efforts in 2014 led to the discussion of local hiring. For example, Altamed recently opened a senior services center in Watts, the MLK community hospital is opening in Summer 2015, and various WorkSource programs offered employment fairs. These examples have started a significant conversation of employment opportunities and skills developments in the top hiring markets for the residents of Watts. Neighborhood Priority #2: Physical Activity – The findings of the City of Los Angeles Health Atlas showed that Watts residents’ life expectancy have not improved over the last 40 years and they have a 12-year lower life expectancy compared to more affluent neighborhoods in the City of LA. This means that important preventive community programs are necessary for an improved quality of life. Examples include the groundbreaking of Monitor Park (now known was Watts Serenity Park) as an example of community participation in transforming a vacant lot to a space where children can grow healthy and play. Additionally, the significant commitment of the East Side Riders brings over a dozen of bike riding and community events to Watts that address youth advocacy, healthy living, and important health topics like cancer awareness and community unity. Following this element of physical activity, Macedonia Baptist Church hosted the First Annual Watts Healthy 5k that included the participation of many residents, advocates, community leaders, elected officials, and partners. The event challenged the notion of a violent Watts when over 200 participants ran through the neighborhood promoting healthy and active living. Finally, the Annual Watts Turkey Trot included a massive collaborative and successful community event to promote health in the neighborhood. There has been a massive mobilization of ensuring the cleanliness of the Watts community. Outside entities have largely contributed to the illegal dumping that continues to impact the livelihood of residents. The We Clean Watts group in partnership with Council District 15 and Beacon House have volunteered to actively improve neighborhood cleanliness. 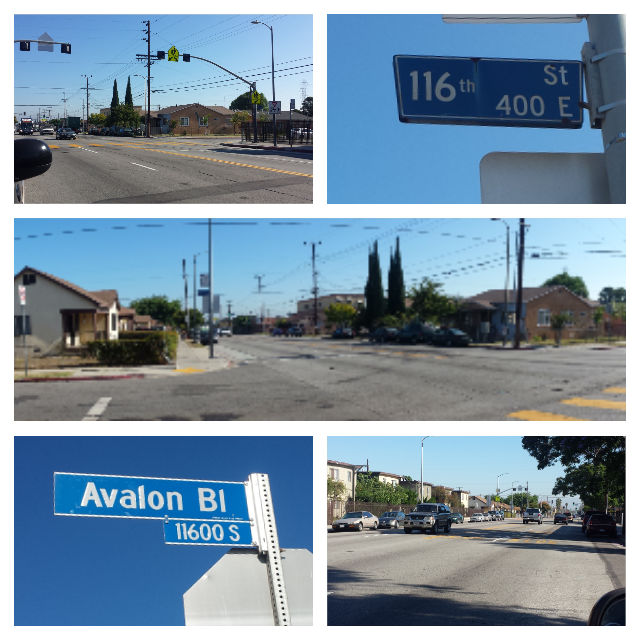 Their efforts in 2014 beautified Watts and made it safer for residents to move through their neighborhood. From clean alleys to sidewalks, this partnership is seeking ways to support its efforts. Additionally, street services identified streets that needed improvement as a larger citywide effort. Watts is a highly resilient community filled with residents that are committed to their self-sustainability and advocacy. Community groups like the School Safety Collaborative, Watts Gang Task Force, and Community Safety Partnerships have actively contributed to enforcing and ensuring safety. Parents actively engage in the collaborative to support their child’s safety when walking to school. Residents attend meetings of the task force to hold law enforcement accountable and vice versa. Further, law enforcement has heard the requests of community members and established their CSP offices in Watts. These efforts serve to demonstrate that interpretations of Watts as a violent community are false and that residents are highly capable of ensuring their livelihood, when offered the opportunities. A history of Watts illuminates a diverse Watts. People from all parts of the world have lived in this vibrant community. The Watts Towers serve as an emblem of European history, the history of rising for the ashes of the Civil Rights Movement places Watts in the Black Power Movement, and the current demographic shifts of Latinos into Watts welcome the tasteful traditions with food and music. In honor of the shifts, the East Side Riders hosted a Dia de los Muertos event. Additionally, community came together across all races to celebrate the neighborhood in the Watts Summer Festival, Watts Towers Jazz and Drum Festival, and an event hosted by the Watts Fire Station. The holidays were very joyful, with the Watts Christmas Parade and Watts’ First Annual Winter Wonderland and Tree Lighting Ceremony that welcome over 300 residents. In the qualitative analysis of the WCS report, residents highlighted the importance of investing in youth. Historically, during the Black Power Movement, youth demonstrated a desire to work in their community and disengage from “risky behaviors.” In 2014, programs from Operation Progress, Children’s Institute, and Watts Labor Community Action Committee re-ignited opportunities for youth. The Watts Gougars championed and many youth were certified in disaster preparedness. Mayor Garcetti recognized the value in opportunities and announced the additional job announcements for youth at the Yo!Watts. This opportunity would open 10,000 more jobs for youth in the Los Angeles area and Watts was highlighted. This is very relevant to the work of the WCS since we benefitted from such programs in engaging with local hired youth from the neighborhoods. All of the events highlight and respond to more than one neighborhood priority, making them effective programming for the future of Watts. As we continue to develop Watts Community Studio as a single entity, the team commits to an annual summer event and in this overview, we include the 2014-Watts Community Studio annual summer partnership. We look forward to announcing our 2015 efforts remembering the 1965-Watts Revolt. Los Angeles City Councilman Joe Buscaino, representing the 15th Council District, is proud to present the Watts Community Studio Report. The Watts Community Studio has been a participatory economic development and planning project aimed at learning more about Watts from the people who live and/or own businesses in the community. Councilman Buscaino believes that involving residents in the decision-making process for their neighborhood will help produce programs, projects and policies that will successfully improve their quality of life. The Watts Community Studio’s final report offers recommendations for supporting residents and businesses in Watts as they build towards the future. A major component of the research was obtaining approximately 750 surveys from the neighborhood and including the young people of Watts in the research process. The results of the survey and various other analyses are included in the Community Summary and Full Report available at the link below. Since the Watts Community Studio presented on its findings, the neighborhood of Watts continues to offer exceptional events that involve community service, civic engagement, and cultural diversity. From the Dia de los Muertos event hosted by INSPIRE Youth Academy, to the Resident Advisory Council elections at some of the developments, to our local Lee’s Market and ESR partnering to deliver food on Thanksgiving, Watts continues to challenge the dominant narrative that it’s an unsafe, violent, and disengaged community. Students at Grape Elementary School enjoy a snow experience in Watts. Watts is active and during these last few weeks residents have offered their participation in the WeCleanWatts event, the 5k Turkey Trot and Farmers’ Market, along with turkey giveaways on behalf of multiple partnerships of agencies committed to serving the residents of Watts like Watts Health Foundation, Children’s Institute, Kaiser Learning Center, Kedren, First Five LA, and many more. Residents have met to offer ideas on the future of Watts through the Our Town Project facilitated by the WLCAC. Additionally, Parents of Watts gave away over 100 bikes to the youth of Watts to continue the active living and cycling movement ongoing in the community.These particular events have had active participation of local residents that demonstrate the continued community engagement in Watts. Sweet Alice Harris and the Parents of Watts blessed the community with over 700 turkeys. 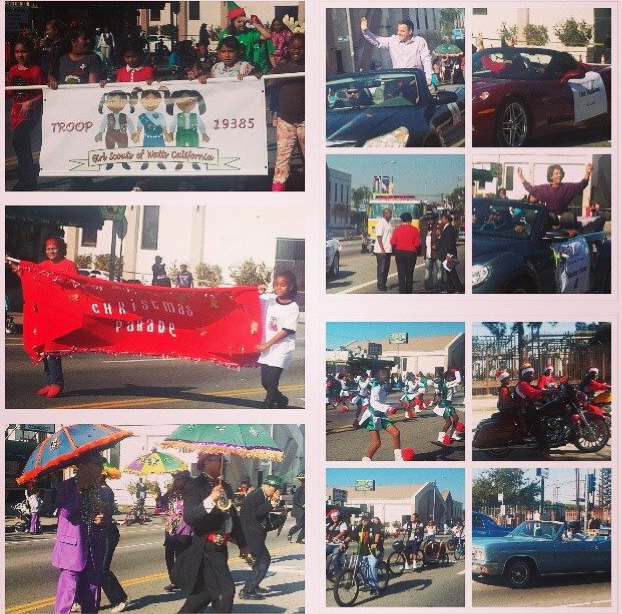 During this holiday season, the Watts Community Studio has witnessed the cultural history that is alive in Watts. Local churches are participating in events like the traditional Posadas preparing for Christmas and honoring the Virgin of Guadalupe on Dec 12, which is also a Catholic tradition. Watts residents celebrated the Watts Christmas parade and unveiled a mural at the civic center that was a product of two great artists from two distinctly diverse communities: Mexico and Philadelphia. Revving up for the Watts 2nd Annual Turkey Trot and so much more… good times! These events are just a summary of the work that is ongoing in Watts that offer a great introduction to the ways in which Watts challenges its misrepresented identity. This most important during this season in which culture, tradition, and values establish a basis for holiday cheer. The Watts Community Studio will continue to share pictures, videos, media coverage, and data about Watts during this season to introduce a Watts that is very different from popular perspectives. Is that a group of Watts residents I see riding down Central Ave? Yes it is! One hot, summer day this past July, students from Inspire Academy High School and staff from Watts Community Studio were walking along 103rd Street pointing out different places and things that they consider to be assets in Watts. One student, Rynisha Alexander, pointed out how she considers Watts to be art and that the different forms of art in Watts is one of the neighborhood’s biggest strengths. Apparently, Ms. Alexander is one among many who feel the same. Two days ago, Al Jazeera reporters released this awesome video on how street art in Watts build bridges across all colors, cultures and artificial boundaries that exist. Please take a minute and check out the video below! As an aim to preserve, and make accessible, the memory of Watts in the context of historical narratives, the WVTC explores the 1965-Watts Riot/Rebellion. This highly recommended 90-minute play demonstrates how performance art, as method for oral history, serves as a way to understand and heal from the remnants of a difficult history in the present. Based on interviews from the 1965 survivors, this play offers an array of artistic efforts (acting, singing, dancing, poetry, and personal narrative accounts) to expose the changing community of Watts, challenge the dominant narrative of both the riots and Watts as a place, and build on community resilience, survival, and history. Unfortunately, it is not getting a lot of coverage and there is a need to expose this play to begin to challenge the dominant narratives of Watts. You’re invited to come to Watts and learn more about its history … please join us! The Results Are In! Join Us to Learn More. The Watts Community Studio team recently finished the preliminary analysis of the 695 residential and 50 small business surveys that were completed this summer in Watts. Keeping in mind that this project aims to inform economic development and planning policy for Watts, we are very excited to present these findings to community stakeholders. Today we debuted our findings and recommendations at a meeting of local stakeholders, held in the Council District 15 Watts field office. This upcoming Friday, November 1st, we are presenting our findings again to a meeting of community-based and faith-based organizations at the same location from 3:00pm – 4:30pm. The general public is able to attend, however, you must RSVP. Seating for the general public is first come, first serve. Refreshments and food will be provided. 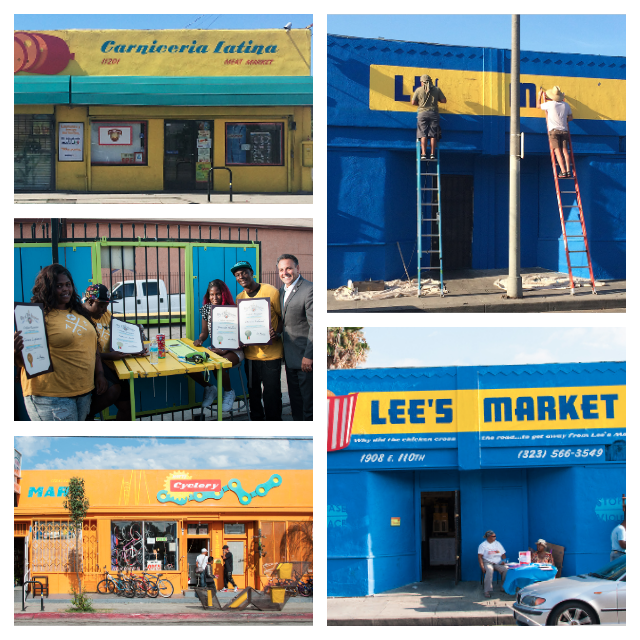 36% of small business owners in Watts have been in Watts for over 10 years! Many residents believe that Watts is improving. Can you guess what the labor force participation rate is for Watts? Come this Friday and find out!